This adventure log will contain spoilers for the D&D 5th edition Tyranny of Dragons adventure, Hoard of the Dragon Queen. Ye’ve been warned! At the last minute, our heroes decided to not jump blinding into the hole from which they heard the alarmed shouts. Instead, they called back to them, attempting to bluff those below. Unfortunately, Tobin chose to use magic to mimic the voice of the half-dragon, who answered back and raised the alarm! They retracted the rope ladder and covered the hole with Mondath’s table, then as much furniture and debris as they could quickly find. The Heroes of Greenest then retreated back to the entry chamber and set up an ambush for the forces of the Dragon Queen, using the fungus-filled corridor as a choke point. A drake led the charge, followed by waves of kobolds. The presence of the half-dragon was felt, but as they battled through the kobolds, he stayed hidden. Two human fanatics* charged through the ranks of the kobolds, and though they gave the heroes some trouble, they too, were dealt with. The heroes pressed their advantage and found the half-dragon issuing orders from the back, attending by winged kobolds. I had to switch from Dwarven Forge due to the complexity of the layout. The myconids are stand-ins for the field of fungus in that corridor. After a brief moment of panic when they realized they were set up perfectly to be decimated by one blast by the half-dragons deadly breath, they charged into the fray. (You can see the PCs all lined up in the center of the picture there… I don’t mind telling you, had they not realized what they’d done, they would have when that half-dragon emerged and breath-weaponed them all; I was planning on it). It was a challenging fight, and Broken Sky was grievously wounded, but in the end, the Heroes of Greenest prevailed. They took a brief respite to bind their wounds and plan their next move. Their next move was to continue exploring the cave complex. They returned to Mondath’s chamber, uncovered the hole and descended. Zinniana scouted the room ahead. It appeared to be some sort of temple dedicated to Tiamat. The walls were carved to depict various types of dragons, and beneath a carving of the dragon queen herself, there was a small chest. The rest of the party kept a safe distance as Zinniana inspected the chest and discovered a series of traps. She disarmed them and unlocked the chest, revealing a handful of baubles. Further investigation lead to another chamber. This cave was essentially a ledge overlooking a sunken area. Two drakes spit and hissed at the party as they approached the edge, and they saw what the drakes were guarding: dragon eggs! Broken Sky counseled that they stay on the ledge and let the drakes come to them as they peppered them from afar with magic and missile weapons. The drakes were well-trained, however, and remained near the eggs. Broken Sky saw this as an opportunity to keep a safe distance and kill them from afar. 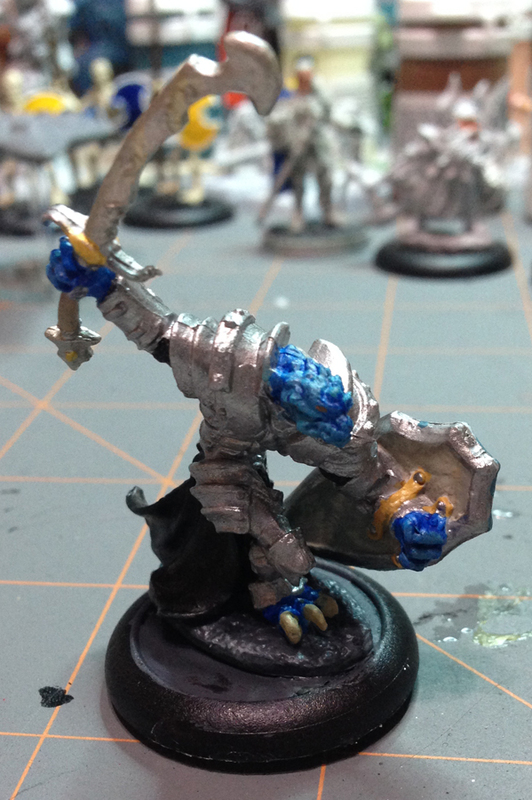 As Flint and Veya maneuvered, though, hidden kobolds attacked with glue and fire bombs. The monk made short work of them and the dwarf and barbarian moved down the ramp towards the drakes, despite Broken Sky’s protests. The monk felt obligated to protect his companions and charged into the fray with the draks where he found a nasty surprise. Near the eggs, one of the stalagmites was, in fact, alive! A roper caught the monk up in his tendrils and tried to make a meal of him. The ensuing battle with the draks was hard fought. Many were brought to the brink of death more than once. In the end, however, the Heroes of Greenest once more prevailed. Tobin took a moment to examine the dragon eggs, and seeing they were black dragon eggs, smashed them, exposing the infant dragons within to a harsh world they were ill-equipped to survive. Bloody but victorious, the Heroes of Greenest retreated from the caves, leaving several chambers unexplored. They headed northwest, toward their rendezvous with Master Leosin in Elturel…. So, the session was mostly a series of fights since the group basically alerted the entire cave complex to their presence (only by way of trying to trick an NPC by mimicking his voice to him). Instead of stealthing through the caves, taking the rooms one at a time and trying to minimize their presence, they ended up fighting pretty much all the remaining kobolds and cultists at once, except for those who stay to guard the eggs. It could easily have been a TPK, but they used the terrain to their advantage and created a choke point in the fungus-filled area. The roper was, by far, the toughest fight even though I held back for 2-3 rounds trying to get them to talk to it, I finally gave in and had it try to eat them (that’s when their dice FINALLY started playing nice). For some reason, my dice HATED the monk, Broken Sky. I regularly rolled 18s, 19s, and 20s on him and by contrast, I had a tough time hitting the dwarf (I rolled a lot of 1-5s on him). I really felt bad because it made me look like I was beating up on the monk for playing his character’s background whenever he charged in to protect the rest of the party. It also annoyed me a bit that I was unable to disrupt the dwarf’s flaming sphere which proved to be a great boon to them during the big fight at the beginning of the session. Still, they prevailed, no matter how close they came to death. Of course, this part of the adventure is really stingy with treasure, and I felt like they needed something, so I gave them all Inspiration to use in the next session. * Yes, these were berserkers and yes, there were Clerks references, hence the video link. 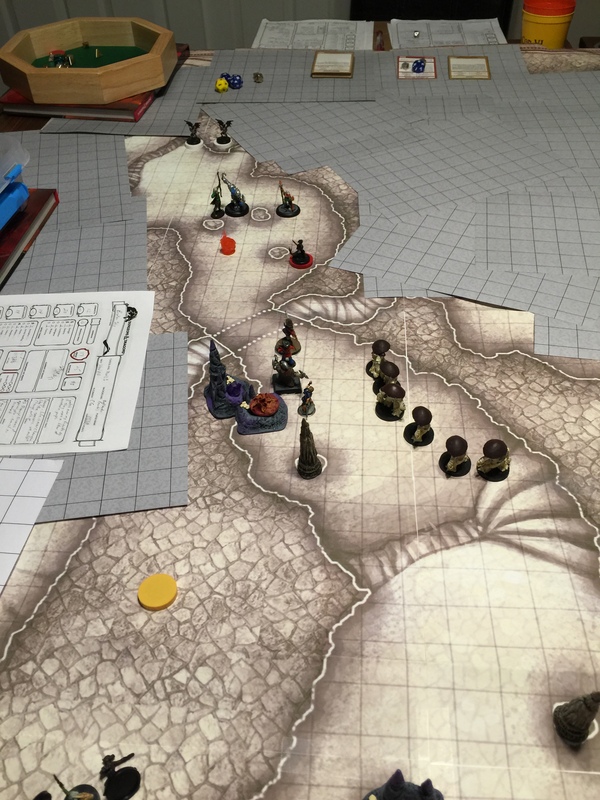 The second trip to the box canyon where the cultists and raiders set up camp was much less perilous. When our heroes arrived, they found the camp all but abandoned. After talking with some surly hunters, they learned that the big cave in the back was still occupied by the Wearer of Purple, the dragon-dogs and the dragon-man. As they approached the cave, they took note of how hastily-abandoned the camp seemed; a result, they supposed, of the recent prisoner rescue. A not-quite-steathy approach to the cave meant our heroes were ambushed once they stepped inside, but they dealt with the cult’s Dragonclaws in short order. There were several passages out of the entry cavern. One was a fungus-choked passage with two trails leading through the fungus. Reconnaissance revealed the presence of kobolds and ambush drakes on the other side and the Heroes of Greenest led the kobolds toward them, ambushing them amongst the fungi. They set traps along the path and threw the corpses of the Dragonclaws and kobolds to the violet fungi in the passage. It seemed to deter the ambush drakes from pursuing. Instead of navigating the deadly fungus and confronting the drakes, the heroes decided to investigate side passages first. They found the abandoned treasury where the raiders’ ill-gotten spoilers were kept, now empty saved for a sleeping, drunken cultist. They dealt with him and scavenged for leftover treasure. What they found was paltry compared to what was stolen. The next chamber they investigated turned out to be a barracks of sorts for the remaining cultists. Judicious use of a sleep spell dealt with most of them, but a few resisted the spell. During the fight, from a connecting room, came an incantation from the Wearer of Purple. One of the leaders of the cultists joined the fray, dealing grievous wounds with her halberd, but in the end, she fell to the combined skills of the Heroes of Greenest. Upon searching her chambers, they found a stack of papers. Most of them seemed to be poetry about dragons, but one was clearly a ledger of sorts and one was a map that seemed to show the cult’s targets. Interpreting the unlabeled columns of numbers would have to wait, as a hole was discovered in the floor of the chamber underneath a rug. Dropping a light down the hole elicited cries of alarm. The heroes of Greenest prepared to lower themselves down and do battle…. It was a good session, though a little slow-paced due to Christmas-related distractions. We were short one player due to illness, and frankly, I’m surprised we were short more. My wife got the flu right before Christmas and it put her down most of the two weeks I took off work. It’s a miracle I didn’t contract it while being home with her the whole time. Lots of Vitamin C, zinc (probably too much zinc… gotta watch that stuff), and hand sanitizer. Or maybe it was all the Christmas cookies I ate. Or both. I spent several hours during my time off setting up that Dwarven Forge stuff, naturally, they chose the path that lead right to the section I didn’t have mapped out. I may switch to a different media for the map next session, though, the rest of the caverns are really hard to render even close to accurately (lots of long, curvy walls, few sharp angles). 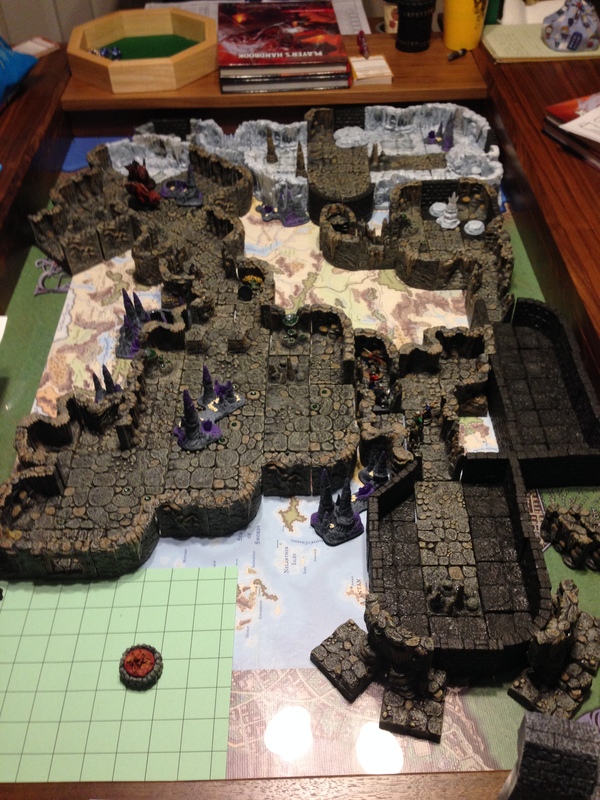 Dwarven Forge works best when you base your map on what you have built already, rather than trying to build what someone else has drawn (unless they stick to squared-off rooms). It definitely adds a “wow factor” to the table, though. It’s a two-for-one Bones day! (This probably isn’t the first time I’ve said that, and it probably won’t be the last). I needed a few miniatures for session 4 of my Tyranny of Dragons campaign (watch for that update coming soon!). For a brief moment, my brain went wonky and I almost looked in the store for new miniatures to represent these two adversaries, then I remembered all my unpainted Bones! 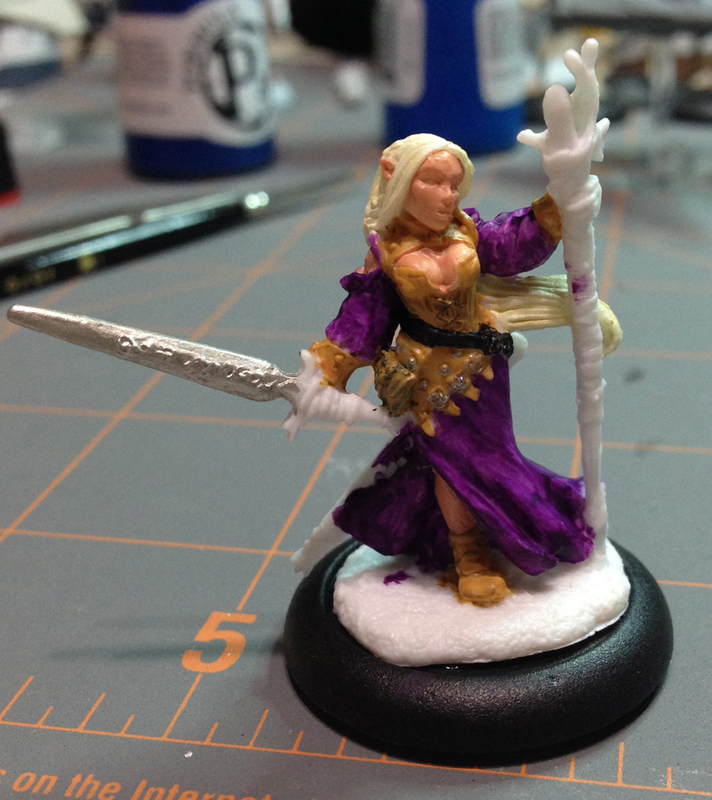 So, for those of you keeping track, today’s miniatures are Dragonman Warrior (which I will be using as a Half-Dragon) and Lysette, Female Elf (which I will be using a human female cleric w/a halberd since I don’t have any miniature like that at all). First thing I did, of course, was to wash them in warm, soapy water (more on that in a minute) and then I affixed them to larger, more stable bases. Since these would likely be used in tactical, combat encounters, I wanted decent bases. After that, I applied the base coats. 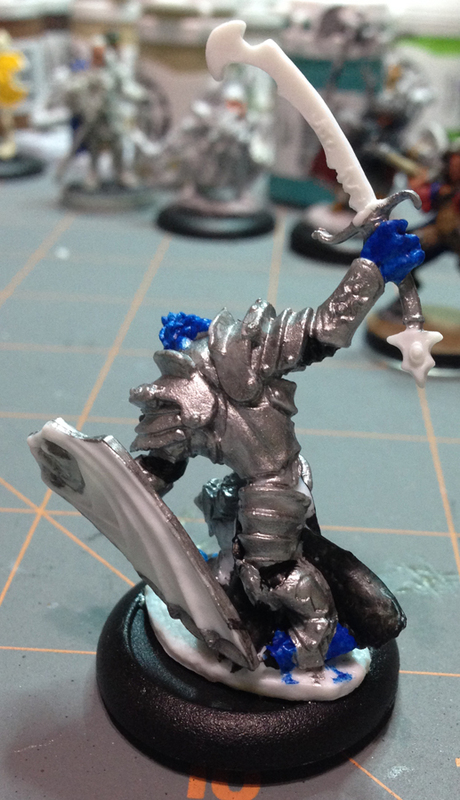 The Dragonman got steel armor and blue scales (per his depiction in the adventure). 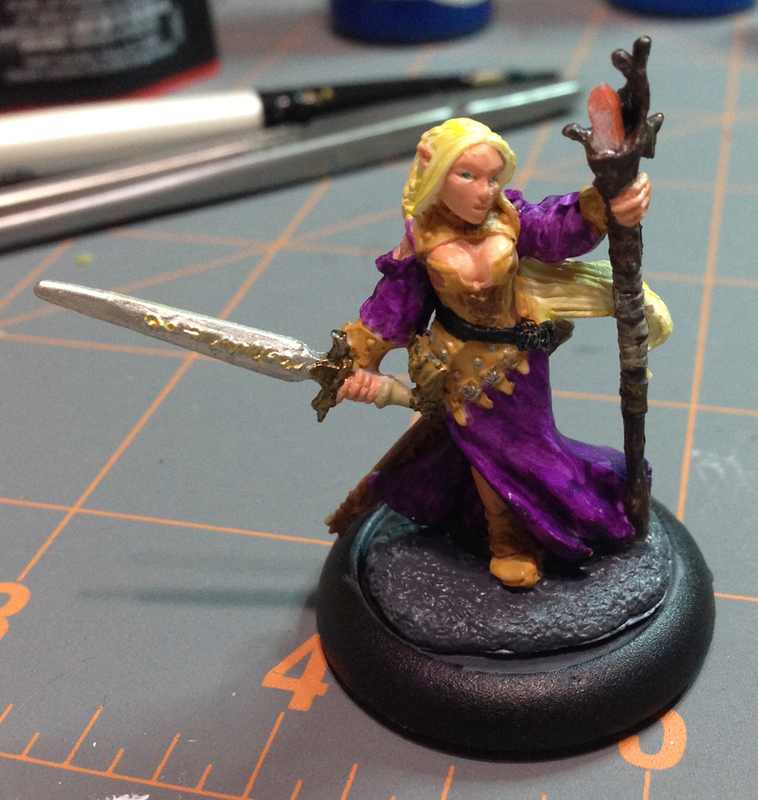 Lysette got purple robes because she’s representing a character known as the “Wearer of Purple.” I learned three things from this: I didn’t have purple paint. Mixing Privateer P3 red and blue (I don’t remember the exact names) doesn’t result in purple, but rather muddy brown, and I FAILED to scrub all the mold release off of these miniatures. You can’t really see it in the pictures because I didn’t take them until I got the paint to properly stick. For Lysette, I used a Folk Art purple paint I thinned with distilled water. I did not thin it enough. 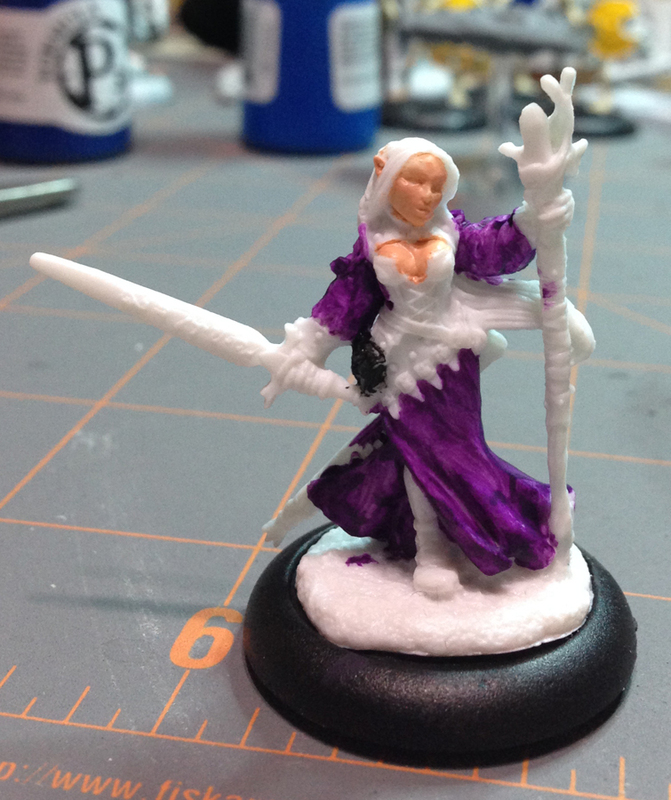 I made do, but I immediately went out and bought more Privateer P3 paints to avoid the mess I made in the future. I ended up changing the color of her pack, too. 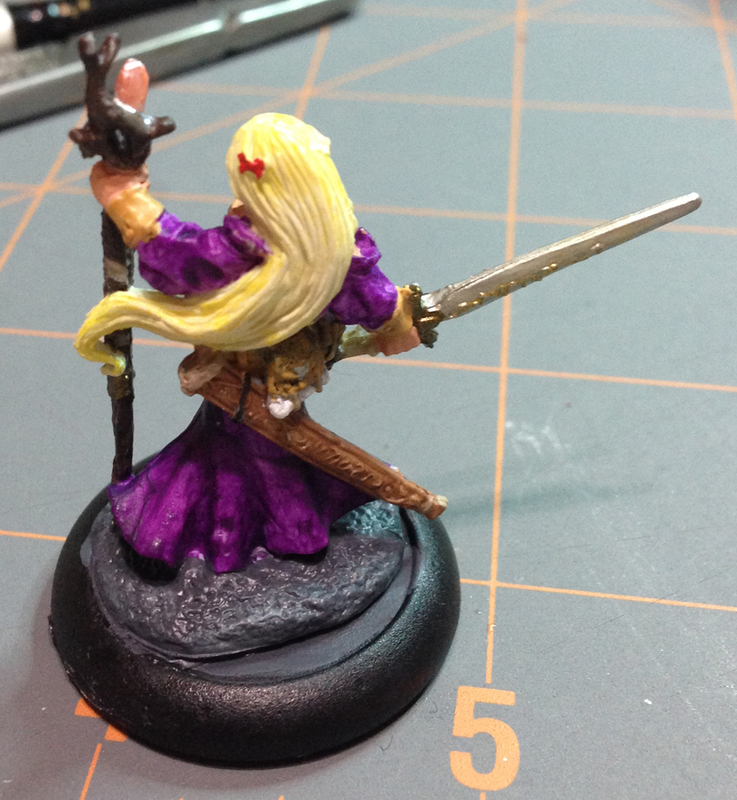 I decided to make her blonde (despite how she is depicted in the adventure) and if I was doing this over, I would ultimately paint her jerkin a different color. Perhaps blue, or maybe red. You can see in these pictures, the base coat of the blonde hair. I am not particularly good at hair, especially if it’s not black or brown. Naturally, I turned to Google. 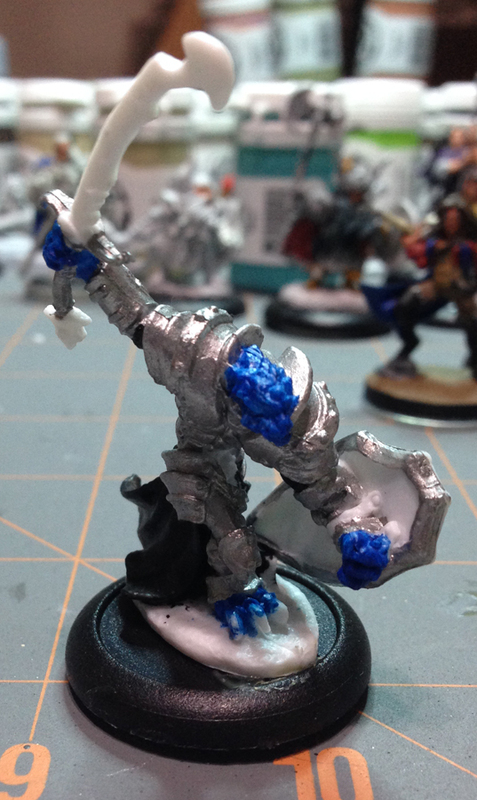 There are a lot of painting guides and tutorials written by far more skilled artists than I. 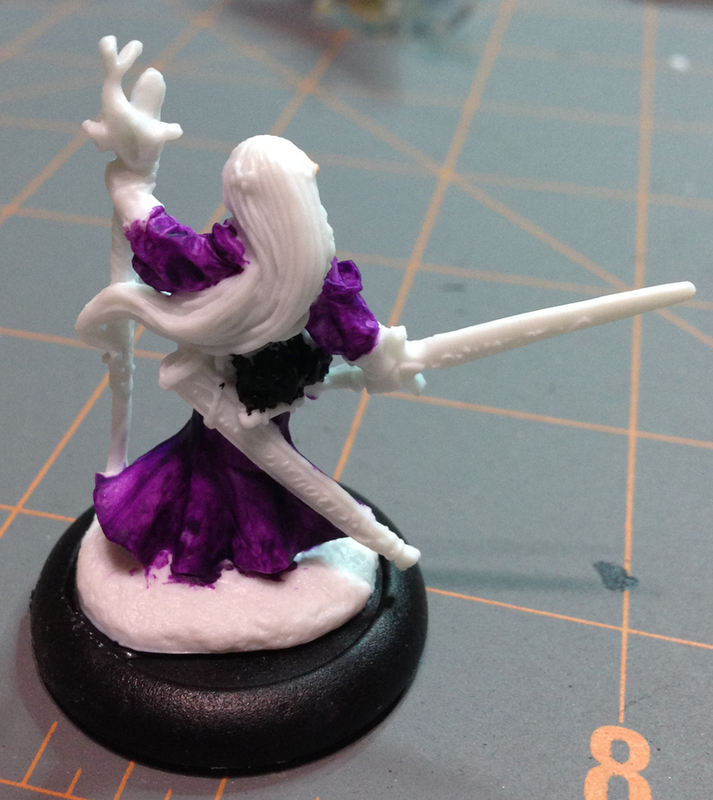 Despite the blob that the purple paint was, I rather like the way it came out. In closeups it sort of looks like the robes were dyed by hand; they have that uneven quality a quick-dip dye job might create. I certainly couldn’t have achieved that effect if I tried. I don’t have an in progress picture of the Dragonman because, well, I forgot. Plus, he’s mostly armor. Now that I’m looking at the pictures, his armor really needs a black wash. I admit, I’m a little afraid to try it because the wash I did on the blue dragon was a disaster. I have another week before this miniature will get used, though, so I might read up a bit on it again and try this weekend. If I screw it up, I still have a few days to try to fix it. 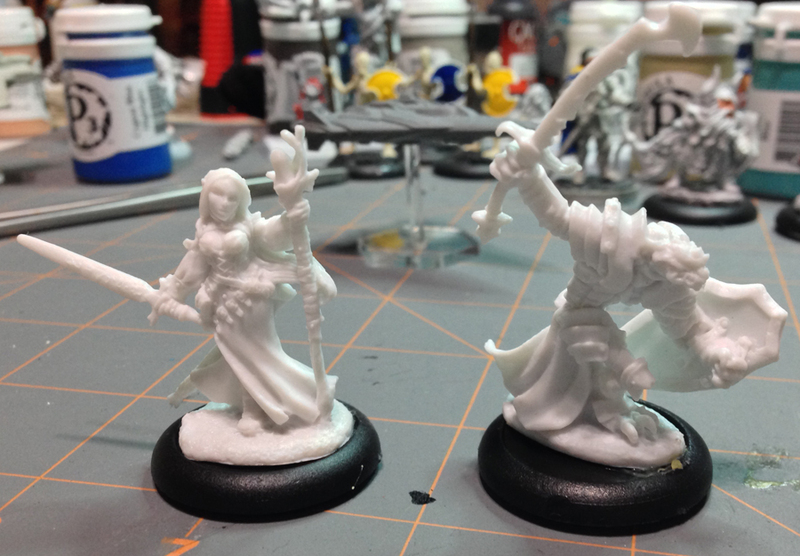 In the end, these two miniatures are better than the last humanoid Bones I tried to paint. There are more hard details on the figures and the faces aren’t just blank… things. The blonde hair turned out okay; I liked the way it started out, but the more I worked on it, the worse it got. I salvaged it in the end, I think. I did like the way the gem in Lysette’s staff came out, though. It doesn’t show quite as nicely in the pictures as it does in person. I painted over the orange color with an iridescent white paint and the effect under light is really nice. It photographs horribly, though. 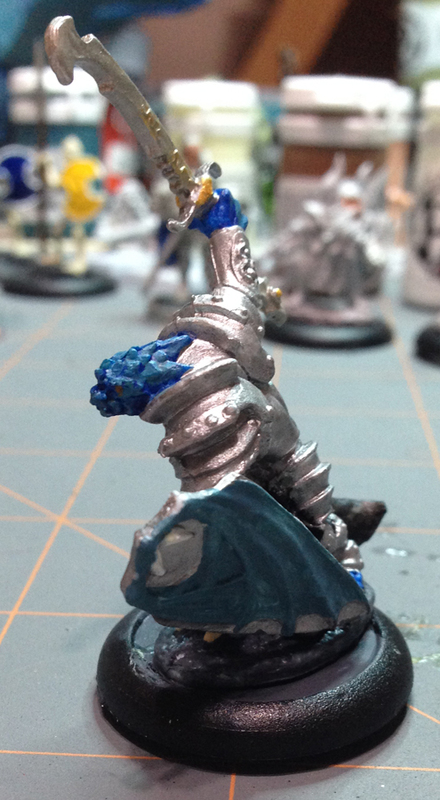 I think I need to dry brush a lighter blue on the dragon wings on the Dragonman’s shield, too. 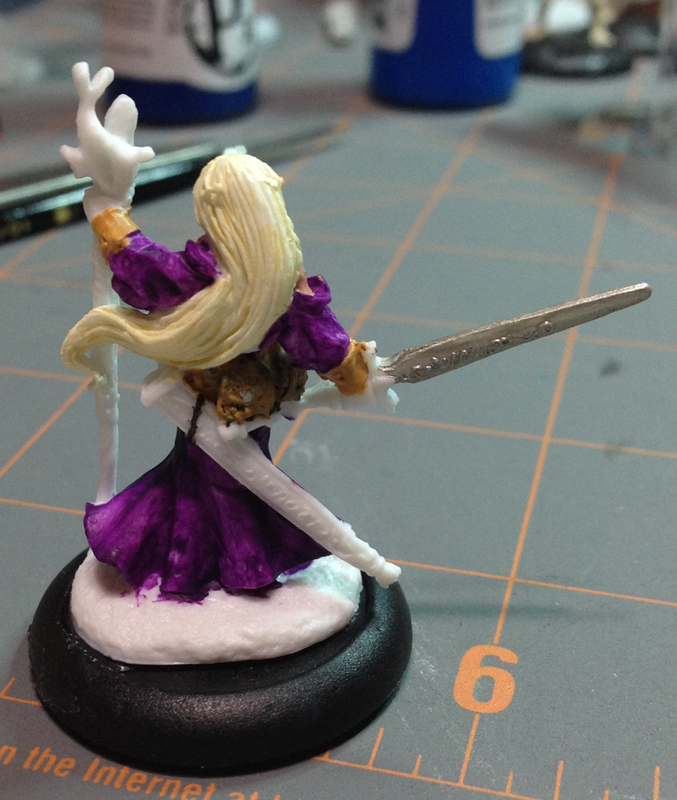 I’m going to work on some townsfolk miniatures, next, I think, as well as finish up some metal minis I have sitting around.